What's so important about our position? An interesting analogy came to me whilst walking my dog this evening, inspired by riders in my Skills Development clinic today where we always revise our position & the way we use it. You know tennis, right? The game? Well, think about the player serving…then think about the player opposite, waiting for the serve. What does this person look like…their stance? I imagine they are waiting with anticipation, balanced yet relaxed, ready to respond in any direction, trying to imagine what will be coming towards them; going through a million scenarios of what they will do if this, that or any kind of serve comes towards them. Ready to move wherever they need to with speed and control. It occurred to me that this is similar to how we need to ride - balanced yet relaxed, ready to receive information coming to us from the horse underneath us, perhaps knowing from experience many possibilities and yet remaining open and focused to give a measured response quickly & appropriately, so that we can give that response straight back to the horse in a way that makes sense to them. Timing is everything. If we are off-balance in our seat, stiff through our joints, tilting, looking elsewhere, feeling uncertain or are unaware of these issues, we will be unable to respond in time or in the right way. It will be a “miss-hit” and an interruption to the continuous “volley” of communication between ourselves and our horse. Not a perfect analogy perhaps but thought-provoking all the same, do you think? So, my trip is coming to a close - four weeks working with Nicole Weinauge in Hamburg plus the surprise opportunity to attend a High School Clinic in Pegestorf with Philippe Karl himself! It's been an amazing journey, expanding my knowledge and understanding of horses, training and people. I've found also many of the things I do in my everyday work with you - my students and your horses - have been affirmed and reinforced. I arrive back in Brisbane on Tuesday 20th September and will need the following few days to take care of personal matters. Regular lessons will recommence on Tuesday 27th September. Please confirm your usual lesson times/dates, and advise if anything has changed during the past weeks, via email or text to my usual mobile number 0427 134 033 (from 20th Sept). The gorgeous PRE stallion "Hercules"
ANNOUNCEMENT: I'll be away from Sunday 7th August and back to resume lessons on Thursday 22nd September. WHY?! In addition to other training here in Australia, every two years I endeavour to train overseas as part of my own coaching professional development programme. In 2012 I went to Portugal & trained classical dressage on gorgeous Lusitano stallions; 2014 I trained intensively with Grand Prix Coach/Trainer & FEI 5* judge Anne Gribbons in Florida on a talented PSG warmblood (read more about my experiences at both places at www.TrishBraithwaite.com.au). This year I'll be spending time with Nicole Weinauge. Nicole is a licensed teacher of the School of Legerete and Head Instructor at the Training Centre Klewerhaaf in Hamburg, Germany. You can find out more about Nicole at www.nicoleweinauge.de. I met Nicole earlier this year when a client asked me to attend Nicole's clinic at Veresdale with her horse. During those 4 days I learned so much more about communicating with the horse through ground work & under saddle, developing lightness and mobility. I found Nicole's technique further developing my understanding of equine biomechanics, classical training and horsemanship and I felt inspired and determined to follow this up with a visit to her home base in Hamburg! I feel in many ways I'll be taking you all with me - seeking to improve our knowledge and training! I am already looking forward to returning to share it all with you. A fantastic masterclass, with training from Novice through to Grand Prix. Thank you to the QLD Dressage Judges Sub Committee for this wonderful opportunity to build on our judging and training education! Over the years I’ve had the lucky privilege to observe and train with some pretty special international jump coaches: George Morris, Jody Sloper, amongst others … and now Albert Voorn, at Heath & Krissy Harris’ property at Mt White recently. Originally from the Netherlands, Albert was the Australian Showjumping Coach 1996-98 and a silver medalist at the Sydney 2000 Olympics. And although these fantastic trainers do share many similar techniques, they also show us that there are many ways to “Rome”. Calmly, in moderate and melodious tones, he explains his training philosophy which remains the same for riders and horses of each level. He expects each group to perform these exercises for the same reasons: the rider must adapt themselves to the horse they’re sitting on, telling him where to go and in what speed - the rest he will work out for himself. Warm up involves riders finding the frame where the horse is comfortable, moving the horse up through the gears and lightening the seat; the horse forward from the spur and carrying the rider who must stay quiet and soft with their body. Albert insists we place too much emphasis on the outside rein, causing our horses to be stiff and pulling them onto the forehand. He encourages riders to soften the outside rein, flexing and bending the horses to the inside, allowing the horse to turn. We witnessed the effectiveness of this - horses softening to the bend and balancing themselves. If the horse then locked onto the inside rein, the rider was to flex him and let him go. Is it the horse that pulls, or is it the rider? Can the aids the rider gives be as little as possible? Serpentines over uprights shows riders how they need to prioritise the smoothness of pace and track. They then move on to the course - practicing these concepts over sequences of bending and related lines, combinations and oxers, making decisions about lines according to the abilities of their horse. Albert reminds them: “It’s by not forgetting your information that you get better! When the rails go up, can you still keep the quality of the basic paces and not do more? Keep the softness!” It is wonderful to see a trainer emphatic about harmony and the comfort of the horse. Why wouldn’t you want to do something that’s so beautiful?, he says. And we agreed. End-of-year training with Chrissie Johnson! Most coaches would agree: we are all a product of not only our own personal experience, but the words, philosophies and training systems of those coaches whom we have followed, had lessons with and have mentored us through the years. And so it is with myself and Christine Johnson. I first met Chrissie in Kuala Lumpur, Malaysia back in 1998 when she was invited several times by the Malaysian Equine Council as Coach Educator for groups participating in the EA Level 1 programme there. Due to her influence in the beginnings of my coaching career, I am pleased to say I still embody many of the same concepts and styles as Chrissie in my teaching methods. Since moving back to Australia (Brisbane) at the beginning of 2009, I have made it a priority to continue my own professional development by training regularly with coaches to improve my teaching, riding and horse training. 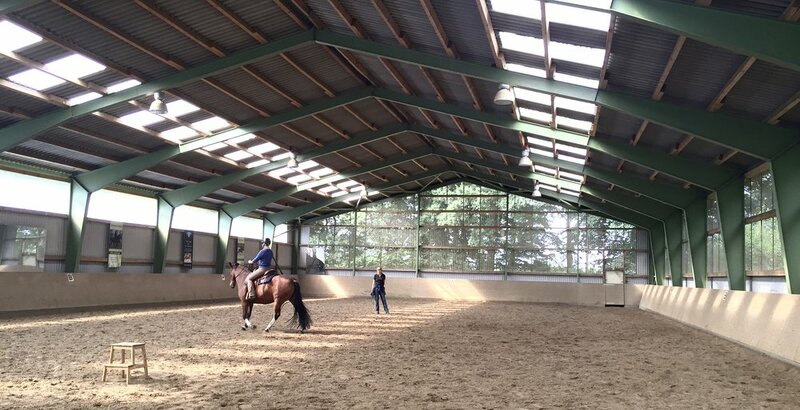 So far I’ve travelled to Portugal to ride Lusitanos and train with the classical masters who have studied under Nuno Olivera and at the Portuguese School of Equestrian Art; to Florida, USA to Ms Anne Gribbons, a FEI5* dressage judge and accomplished Grand Prix rider and coach to train PSG on a lovely Swedish warmblood gelding she found for me to ride. And now I’ve experienced a just-as- valuable experience with EA Level 2 Showjumping Specialist and Coach Educator Ms Christine Johnson, whose training centre is conveniently located at Nelson, just an hour north west of Sydney. Her son George also works and trains there, with his string of show jumpers and loyal following of students keeping him busy. Our priority for the week was refreshing my coaching. I teach full time in Brisbane and like any job (even one you love and is your life!) it’s easy to become stale and lose focus. And as a free-lance coach, there are few opportunities for co-working: sharing ideas, discussing issues and lesson processes as they happen. Working with Chrissie this week, observing her and George teach their regular students and noting the things they prioritised in those lessons has been enormously valuable. I loved to hear the words, explanation styles and timing they used; witness the various exercises they put their riders through and why they used them. Chrissie gave expert critiques of my lessons (thanks to all the enthusiastic “guinea pigs” who were my students for their sessions!). I was reminded of the importance of the basics of good riding; helping the rider understand the movement of the horse so they’re able to follow with a softer body, hand and balance; taking care of the little things so the bigger things are already taken care of; using various and specific exercises to develop the confidence of horse and rider together. We were also very lucky to observe show jumping master Albert Voorn at his clinic at Mt White. His concepts of comfort of the horse and rider throughout the work at every level made so much sense, and we immediately found how we could fold those ideas into our own styles of teaching. Another personal coaching evolution and opportunity to expand the “tool box”! Position Yourself in The Training Scale! So, now you have a good idea of what a correct position entails (see previous post)...but how do you turn this into effective riding? Firstly, what do we mean by “effective riding?”. A correct position translates to the possibility of effective communication with our horse through subtle and non-verbal cues. Riding effectively means that we successfully use our position to ask and allow the horse to move where and how we wish. In Dressage, we relate our progressive training directly to The Training Scale and riding with an effective position is an integral part of that! Anyone who has spent any time in the wonderful world of dressage has come across this concept. There have been thousands of excellent articles written on the subject and rather than reinventing the wheel here (and risk boring myself and you! ), please refer to the EA National Dressage rules Section 7 - Paces and Movements: http://www.equestrian.org.au/site/equestrian/national/downloads/2005/dressage/rules_tests/2012%20Rules%20and%20tests/2012%20Dressage%20Rules.pdf for a full description. Rather, we shall be looking how our riding affects these principles. Rhythm is where it all begins! In walk, trot, canter including the collected, medium and extended paces (also free walk! ), our position will affect the rhythm in negative and positive ways. If we do not allow our body to move in rhythm with our horse, how can we expect the horse to walk/trot/canter in the correct sequence of footfalls with fluidity and cadence! * When my horse walks or canters, do my elbows remain soft and allow the head to move? * Is my sitting trot allowing the horse to move with elasticity and correct tempo? * In the canter, am I sitting with the leading leg, or against it? * In all paces, am I plugged in with my seat on the centre of gravity so I can move together with my horse, or is my seat constantly shifting, allowing my upper body to move in front or behind the balance of movement? Our position must remain correct with sufficient muscular tension yet relaxed and dynamic in order to move with our horse. Experiment with the feeling of too much/too little tension in your muscles (break it down section by section eg. forearms, thighs, lower back etc) to find the right balance for you. Observe how the differences affect the way your horse moves forward. a. longitudinal: over his back, within the “circle of contact” where energy is able to come and flow through the frame without any blocking. b. lateral: musculature on either side of the horse can stretch & contract equally. 2. mental suppleness - where the horse is relaxed, submissive yet still moving with energy! We expect our horse to be “supple”, but what about the rider??! If you can’t move easily through your day without struggling and hurting, think about how this will carry through to your riding! You will “hold” when you need to “give”, “collapse” where you need to maintain equilibrium and if you are not able to move fluidly, then your horse will struggle to do so also! Contact - The horse accepts and follows the rider’s hands. Contact is supple, elastic and correct. Correct contact is the “circle of contact” where energy, created by the hind quarters, flows through the horse’s body without impediment from both hinds legs equally into both sides of the mouth (which is essentially the rider’s hands). The horse is able to move freely within this contact when required, demonstrating an elastic frame and suspension of the steps. * Do I encourage the activation of the hind quarters? * Do I maintain an elastic and dynamic feel of my horse’s mouth so he is encouraged to remain and grow in confidence within the contact? * Am I well-balanced in my position to be able to establish and maintain a good contact, or am I constantly letting the reins bulge then pulling my horse’s mouth to hold myself still? Again, experiment with too loose/too firm contact to see how it effects your horse’s forward rhythm, his frame (longitudinal suppleness) and bend (lateral suppleness). See how it’s all coming together? Impulsion - Forwardness and energy generated from the hind legs (not speed!). How much impulsion to ask for depends on the level of suppleness & contact, as impulsion “channels” through the supple musculature of the horse into an elastic contact. Keep the impulsion at a level at which you and your horse can stay in balance! There is no point creating a wonderful energetic trot if you are unable to sit it. As a judge, I have seen some entertaining examples of beautifully moving horses with unbalanced, struggling riders. Before long, the horse will grow tired of the struggle - training and performance will start to go in the wrong direction. For me, suppleness is the key - the more supple you are physically, the more able you will be to move with your horse and stay in balance. Build the impulsion hand-in-hand with your ability to ride it! Straightness - The horse’s hind feet tract through to the footfalls of the front feet (i.e. the left hind tracks through to the left front, and same for the right side). Sounds straight forward, right?!! If your horse is supple, then he has a good chance of being straight. The same goes for us as riders - if you are physically supple, you will be able to sit straight! Again, as a judge I have seen some interesting riding positions, with rider’s sitting off to one side which of course has the horse trying to balance underneath them, with the result of the horse ending up on 3 or 4 tracks! Suppleness = straightness = a sound & efficiently-moving horse. Collection - Can you ride an effective half halt? This is the path to collection. As a result of correct rhythm, excellent suppleness, acceptance of contact, a good impulsion, remaining straight, then the horse can gradually become more “closed” and move in balance/self-carriage. Through the horse’s acceptance of effective half halts, there will be a progressive lowering of the hind end, a freeing of the front legs & lightening of the front end. The co-ordination of your aids from a correct position will enable you to ride half halts with excellent feeling and responsiveness. Remember that everything is a progressive development! This bears mentioning again: it is UP TO OURSELVES to be disciplined riders! Ride consciously. Break it down step by step and allow yourself (and your horse) time to make the corrections for a more harmonious partnership. By the by, it’s interesting to note how The Training Scale relates not only to Dressage, but to all other equestrian sports. Think about showjumping, carriage driving & vaulting for instance. These disciplines also require Rhythm, Suppleness, Contact, Impulsion, Straightness & Collection as the benchmarks of harmonious education and development of the horse. Trish Braithwaite is a qualified EA/NCAS Level 1 coach, assisting riders of all ages & abilities and their horses in dressage, showjumping & crosscountry training. Trish coaches full time in & around Brisbane, Australia. She can come to you at your place or to another suitable venue, anywhere. Contact Trish at shutupandride@trishbraithwaite.com.au or 0427 134 033.